Dr. Curtis Deutsch’s research is aimed at understanding the interactions between climate and ecosystems. He combines numerical models of varying complexity with diverse types of biological and physical data, to discover the ways in which climate produces spatial pattern and temporal variability in ecosystems, and thus influences their basic functioning. Most of this work has focused on biogeochemical cycles in the ocean, with a particular emphasis on the mechanisms that regulate the cycles of nutrients and oxygen over a range of time scales from years to millennia. He also works with terrestrial ecologists to understand how climate influences the patterns of thermal fitness, and their implications for biodiversity in a changing climate. 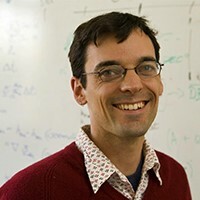 He received an Investigator Award from the Gordon and Betty Moore Foundation, and is a Fellow of the Kavli Frontiers of Science. This is the third installment of The Future of Oceans lecture series (learn more about the series here).